You have all heard the joke, "If a tree falls in a forest, will anyone hear it?" 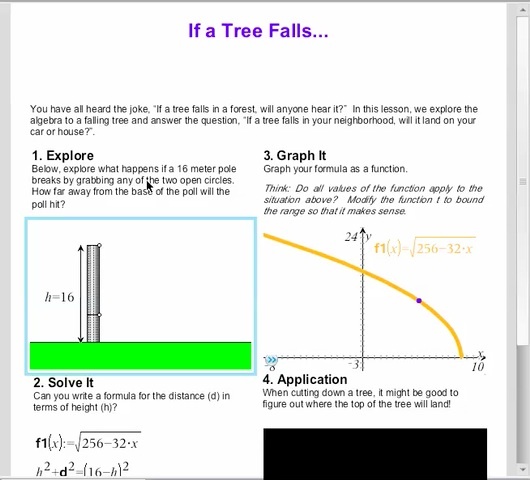 In this lesson, we explore the algebra to a falling tree and answer the question, "If a tree falls in your neighborhood, will it land on your car or house?". 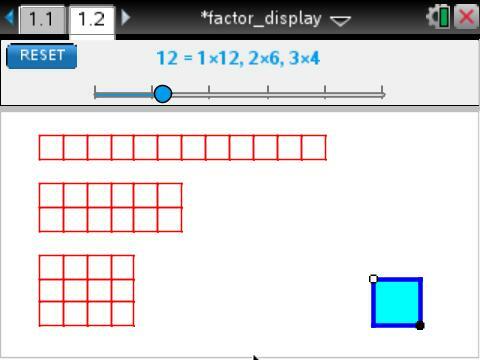 Use the slider to visually display the factors of whole numbers. 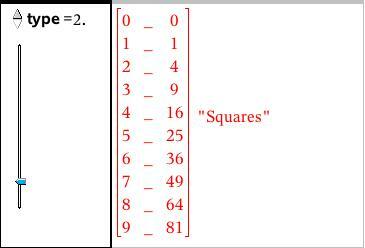 Drag and resize the square to find square factors contained within! Learn how to calculate square roots and cube roots - in your head! Learn the relationships between the multiplication and division of exponents with this novel approach. 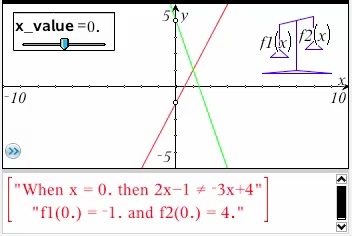 Use the number line to compare the different rational representations, then move on to the second document, in which students learn the four operations using visual approaches. 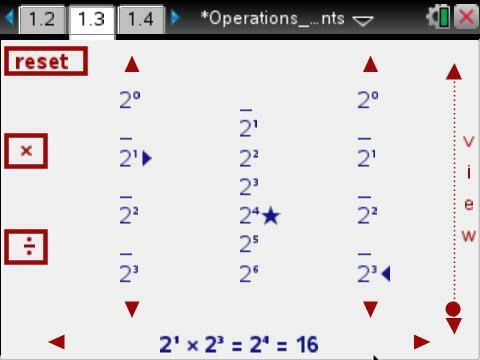 They then get to consolidate by estimating position on the number line, and calculating using the four operations in a guided tutorial quiz. 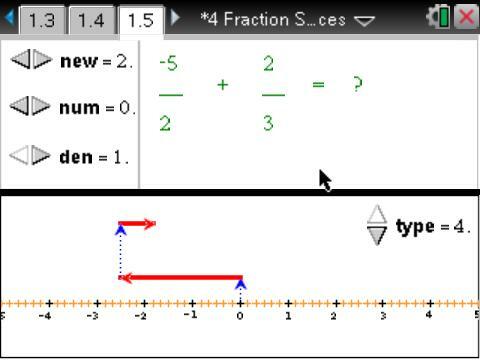 Learn to add, subtract, multiply and divide fractions using visual approaches and then master the numerical processes. 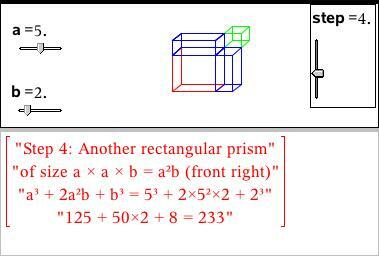 Use this dynamic visual treatment to explore, first the square of sums - (a + b)2 and then the cubes: (a + b)3. 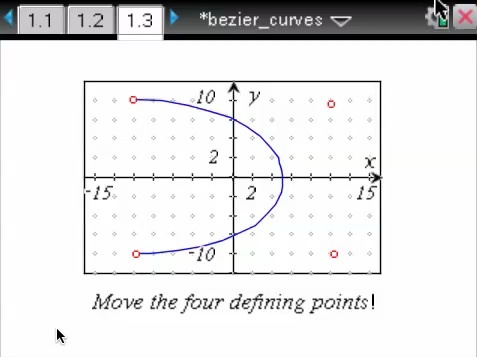 The two interactive tutorials in this document take the user step-by-step through the methods of solving linear systems of equations in two variables by both substitution and elimination methods. 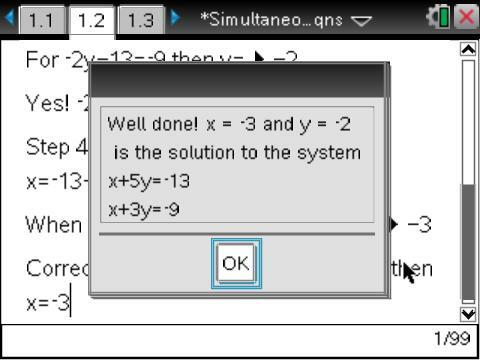 Have the systems randomly chosen, or enter your own, then follow the directions. Because this uses keyboard input, this document is not supported by the Player, but can be downloaded and run locally. 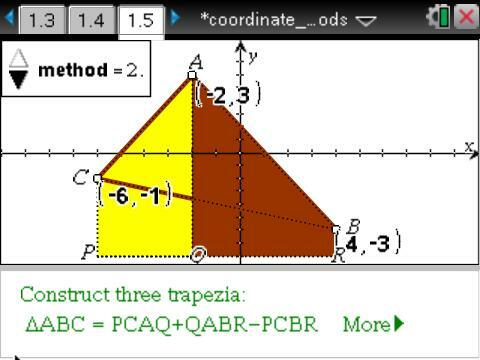 Use a variety of different approaches for finding the area of a triangle and other coordinate geometry methods. Create and display datasets in a variety of ways. 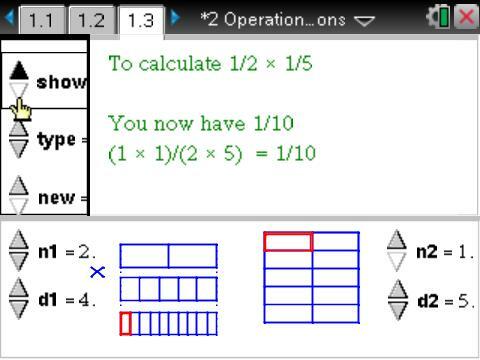 Learn to solve equations using various representations - graphical, algebra tiles and then symbolic approaches. Unwrap the nets for tetrahedron, hexahedron and triangular prism. 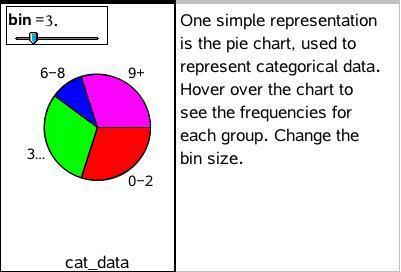 Display the cumulative frequency ogive for a given data set. 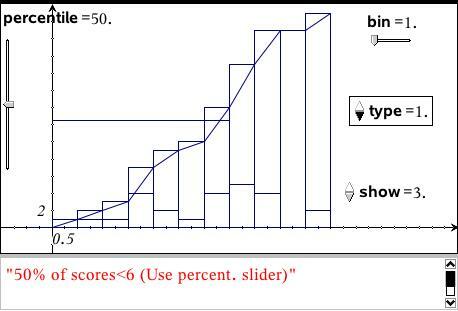 Vary the percentile and bin width. 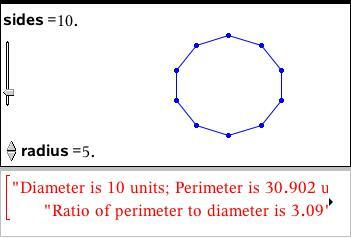 Increase the number of sides and study the change in the ratio of perimeter to diameter of the polygons. View the results numerically and graphically. 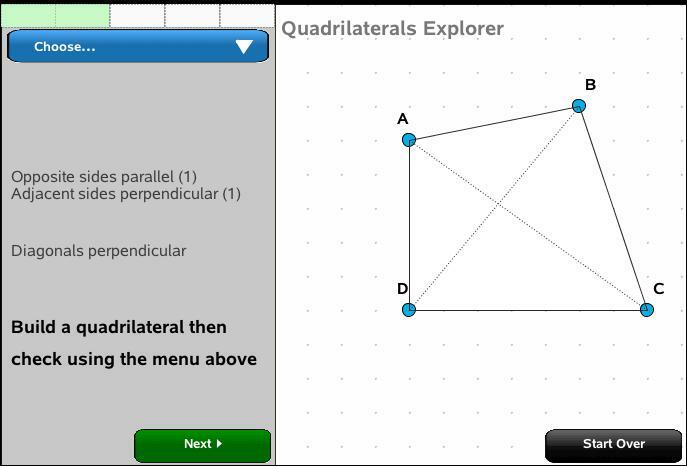 Explore the properties of Quadrilaterals in this detailed document. 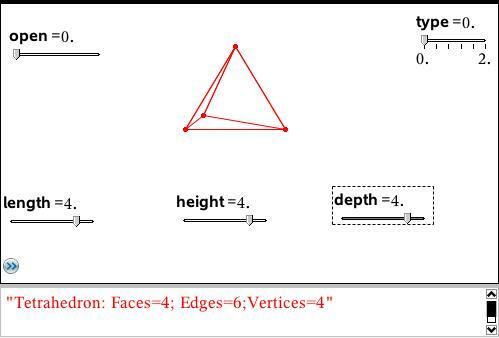 Begin with recognition of the different shapes, then move to the properties. Finally put it all together with a dynamic review. Build number patterns using shape numbers: square, rectangular and triangular numbers to give the sums of odd, even and counting numbers. 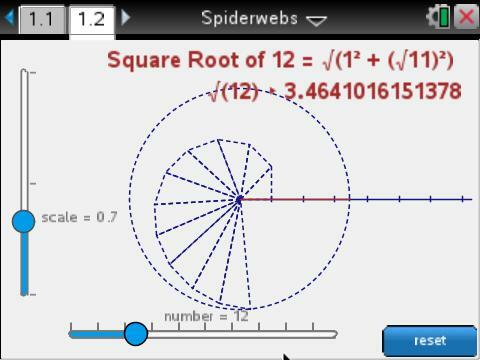 Use the slider to build a spiderweb using successive triangles to build the irrational square roots of numbers. See these positioned on the number line. 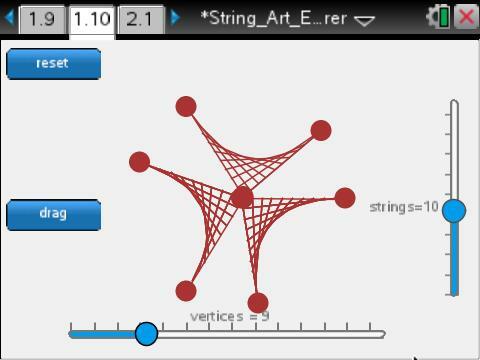 Create beautiful patterns and explore mathematical ideas with this dynamic string art explorer. 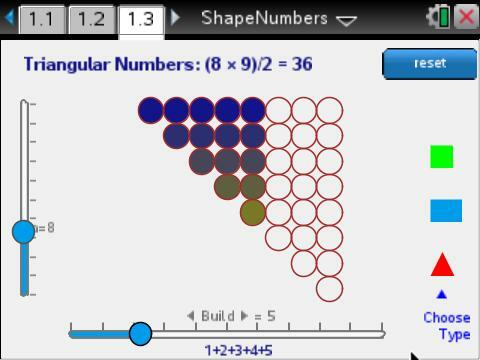 Explore mathematics using the computer language LOGO - and see how easy it can be to build amazing patterns! 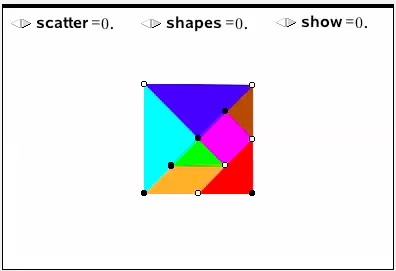 Use the ancient shapes of tangrams to solve problems involving geometry. Drag and rotate the various shapes that make up the tangram. An introduction to a fascinating part of mathematics that brings together number, geometry and algebra, along with a little artistic creativity along the way! 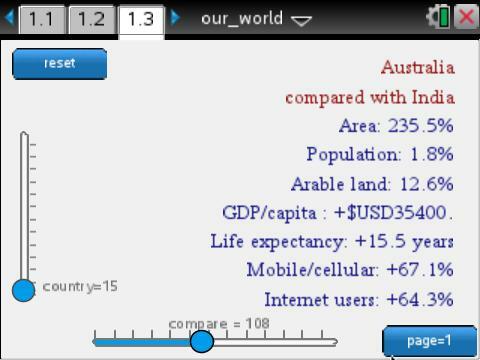 Use the sliders to explore and compare all 255 countries of the world.